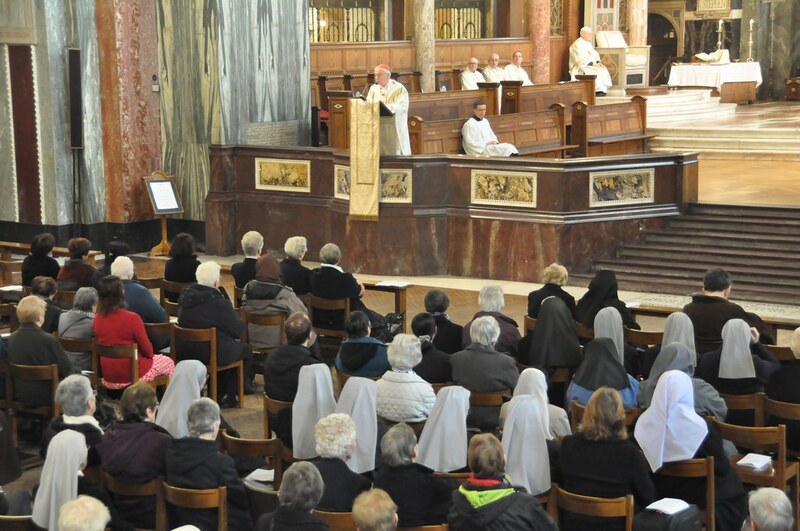 Cardinal Vincent celebrated a Mass to inaugurate the Year of Consecrated Life on Saturday 29 November at Westminster Cathedral. Concelebrating were Bishop John Sherrington and priests from the Diocese. Cardinal Vincent began his homily by reflecting on his visit to the parish of the Holy Family in Gaza the previous Sunday and the devastation which he witnessed. He praised the work of the 12 religious sisters from the Congregation of the Incarnate Word, the Sisters of the Rosary and the Missionaries of Charity who dedicate their lives to serving those among whom they live. Addressing his words to those in cosecrated life, the Cardinal spoke about the source of this joy being in the Scriptures proclaimed at the Mass. The Cardinal encouraged those in consecrated life to share their stories and to continue to radiate their joy. The Year of Consecrated Life begins at Advent and continues to February 2016. The Cardinal's full homily can be read here.